Hillsong UNITED - The People Tour MMXIX is on sale now! Come and worship with UNITED when they visit your city. Experience them live as they lead classics like 'Oceans' and 'So Will I' and introduce you to some of their amazing new music! Join them in your city! Click below to find yours! 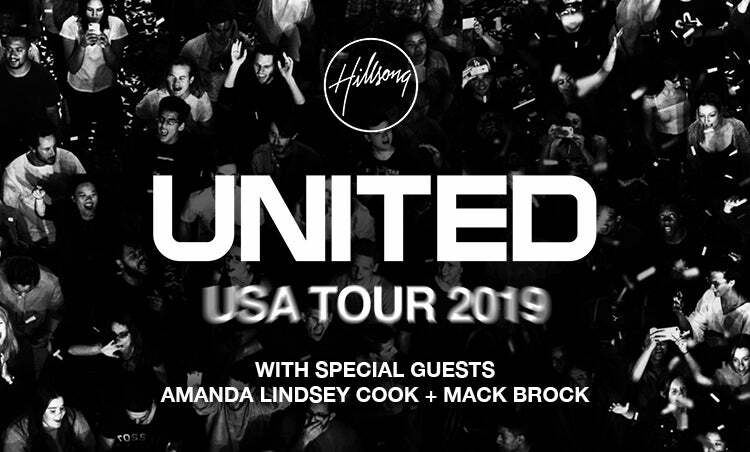 Hillsong UNITED is back for their 2019 tour! Make your plans to join them alongside special guests Amanda Lindsey Cook of Bethel Music + Mack Brock! Formed in 1998, Hillsong United is led by Brian and Bobbie’s son, Joel Houston. Hillsong United has created 17 albums. Their song Oceans (Where Feet May Fail) from their album Zion reached platinum status in the U.S. The group has toured for many years, packing out large venues like the Staples Centre in Los Angeles. In 2016, Hillsong United was named Top Christian Artist at the Billboard Music Awards. Over the last few years, Hillsong UNITED has evolved as a band, but never lost focus on their one purpose and passion: Worship. Creative, diverse and not limited to any one demographic, the heart of Hillsong UNITED is to create music that reveals the truth of who Jesus is. Lineup subject to change without notice.